Mission launches QX speaker series | What Hi-Fi? Sitting above the brand’s entry-level LX series, the QX is an eight-strong hi-fi and AV range – and debuts at the Indulgence Show this weekend. Mission hit form last year with its budget LX series – as the Award-winning LX-2 standmounts go to show – so naturally the British brand is looking for similar success in the next price bracket. Hence its new QX series. 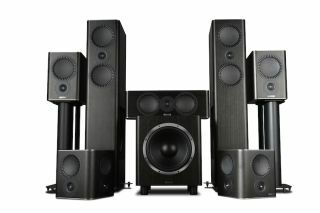 The range comprises two bookshelves (QX-1 and QX-2), three floorstanders (QX-3, QX-4 and QX-5), a centre speaker (QX-C), surround speaker (QX-S) and subwoofer (QX-12). The QX-1 (£300), QX-2 (£380), QX-3 (£700) and QX-4 (£800) are two-way designs, while the QX-5 (£1000) has a three-way configuration. Every speaker* in the QX range features a new ring dome tweeter and Mission’s DiaDrive cone system, and continues the brand’s traditional tweeter-below-mid/bass array. This arrangement is claimed to aid the time-alignment (and consequently the integration) between the drivers. *Except the subwoofer, of course. The 300-watt QX-12 sub (pricing tbc) takes its name from its 12inch (30cm) driver. The Mission QX speakers, which come in white, black or walnut finishes, are debuting at the Indulgence Show in London this weekend and will be in a store near you in November. November 2017 issue now on sale!